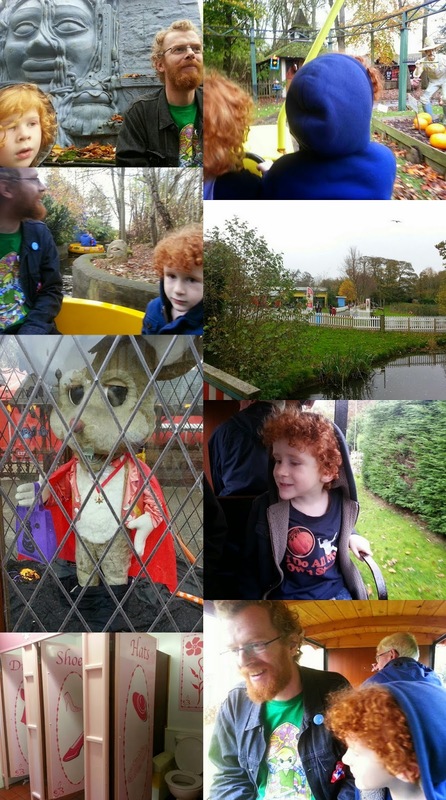 Yesterday we had a smashing day out at Gulliver's World in Warrington. 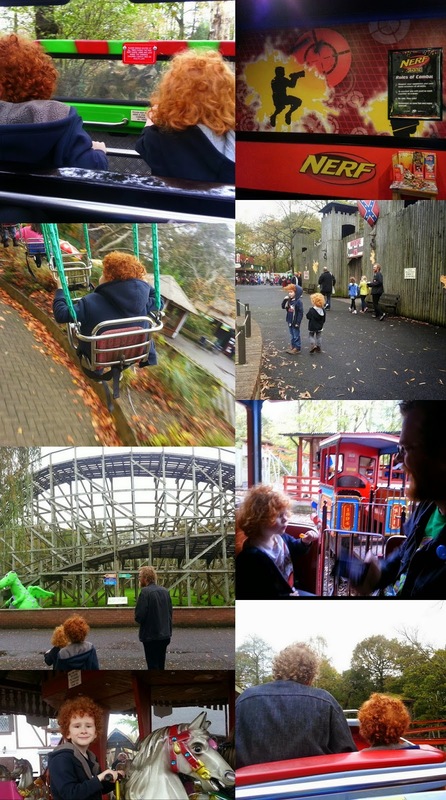 We only took the 2 little boys as the teenagers were all elsewhere, and that was ideal because Gulliver's World is a theme park especially suited to families with children aged 2-13. On the way home our 6 year old pronounced it "the best day ever". 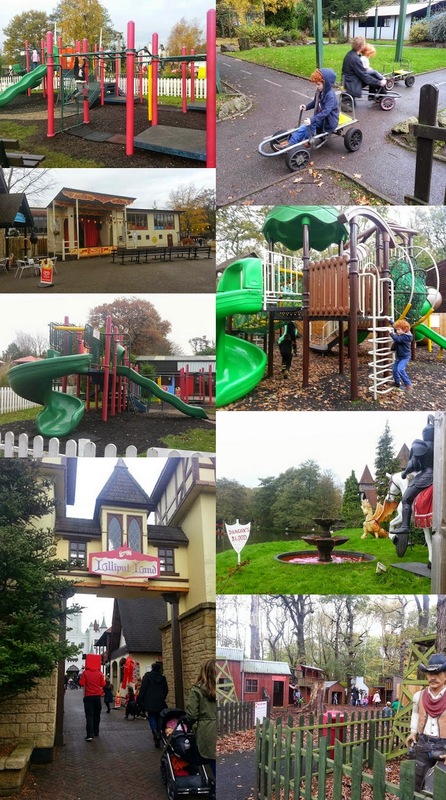 Set in spacious grounds, but compact, incredibly flat and easy to walk around, even for younger children, Gulliver's World has over 90 rides, shows and attractions. Our youngest is a small 4 1/2 year old at exactly 100cm, and it was great to see that he could use almost every ride and activity in the park - he's only too short for 5 rides. Even at 80cm a child can use over half of the rides and activities. At 120cm your child can go on every ride and activity in the park (except the Big Top Soft Play because they've outgrown that). Dotted regularly around the park are park areas and play equipment, with plenty of benches and seats for the grown ups to sit and relax while the children play - and toilets everywhere! Everything about Gulliver's World is inexpensive. Parking is free, there is space all over the park to eat picnics, and food in the cafes, restaurants and shops is really reasonably priced, basic but well made. Vegetarians are incredibly well catered for. This gorgeous burger was part of a meal deal with a coffee and chips for under £5.65. 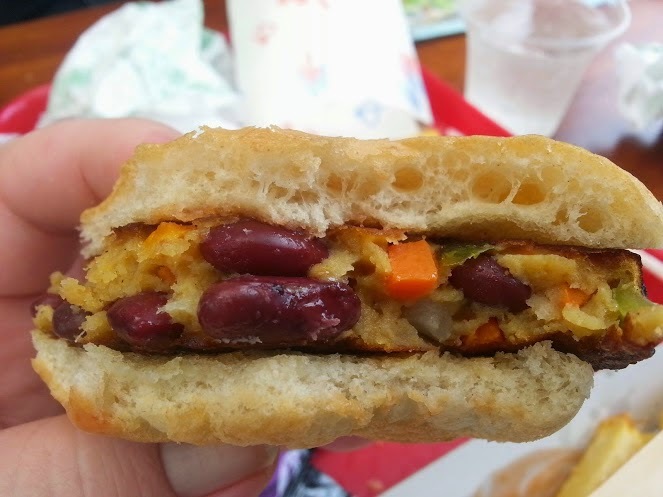 The children's meal deal was around £4 for sausage, beans, chips and a drink. Entry is also inexpensive at £17 per person over 90cm tall. Because the park has such a strong family orientation, unaccompanied adults aren't allowed to visit without a child, and under 16's aren't allowed entry without a grown up. This means that every adult there is visiting with children, and understands when your child screams/trips/cries/runs around like a lunatic! 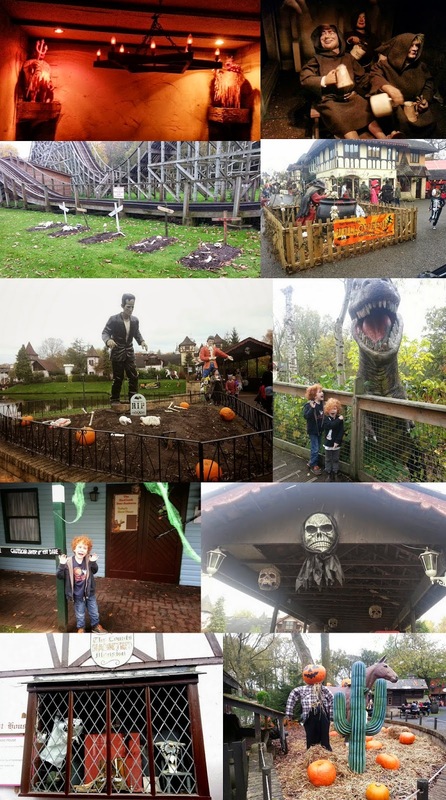 The Haunted House might always be a bit spooky, but the entire park had been decorated for Halloween and the effort that the staff had gone to was really impressive - cobwebs and skulls were everywhere, but it was all really gently done with children in mind so that it wasn't really scary. 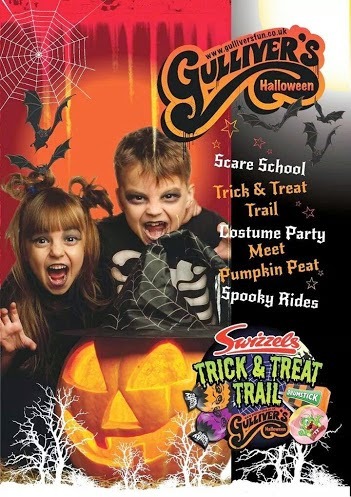 We were invited to visit by Swizzels, who are running a Trick And Treat Trail at Gulliver's World all this week leading to Halloween. Dotted throughout the theme park are Treat Stations where the children take part in a short activity and receive sweets in return. 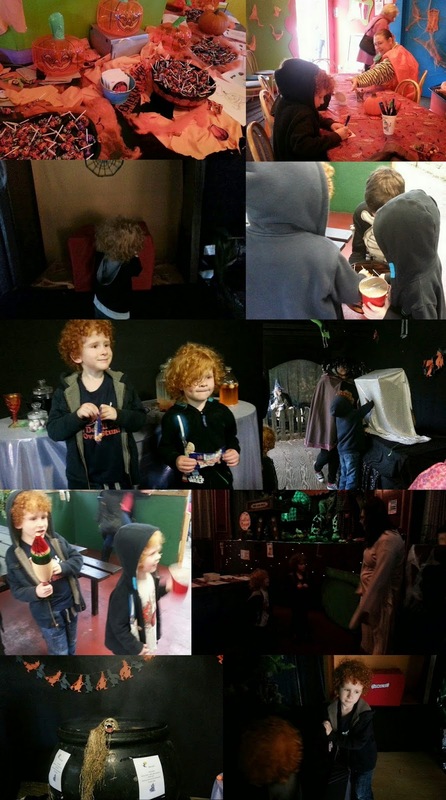 We found them all, and along the way we added ingredients to a cauldron, played an instrument, put our hands into boxes to see if we could find creepy crawlies, drew a face on a pumpkin sticker and coloured pictures of Halloween characters. The boys loved it! We had a lovely day, the queues were really short, the pace was relaxed and we actually got to sit down and relax throughout the day as well as trying every ride and attraction we wanted. The boys really enjoyed being able to point at a ride and nearly always we could say 'okay, we'll do that next'. The day ended with a costume parade and sweets for all of the children who joined in. Every member of staff we met was absolutely lovely and couldn't be more friendly or helpful. It seems like it must be a lovely place to work, and everyone knows the park and their job really well, and is suited to it. One of the things that struck us was how incredibly clean the park was. The only thing letting it down is the inability of a few guests to tidy away their own rubbish after they'd eaten. Bins were never full, pathways were litter free. There are designated smoking areas away from queues and play areas, and even though there are toilets absolutely everywhere, they were all spotless. 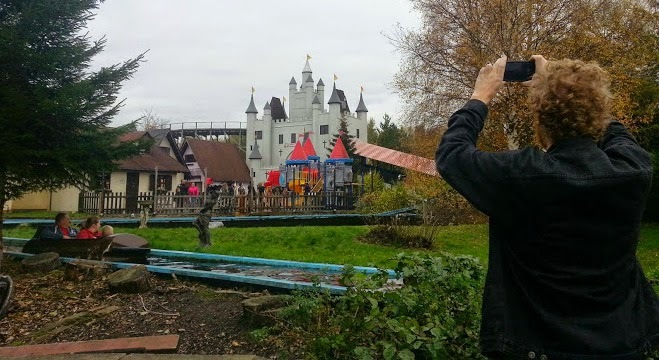 It certainly isn't the biggest or newest theme park, some of the rides are a gentle 2 minute drive around a tiny flat track and it wouldn't impress my teenagers, but for families with young children it's a brilliant place to visit. The prices are great value, the staff are fanastic, the rides are thrilling for youngsters and the queues are short. We will definitely be back - and soon! You're almost too late to see the Halloween decorations, but Gulliver's World will be re-opening 4 days a week from the end of November for their Christmas celebrations and I know it'll look amazing. Santa and Mrs Claus will be there with their Elves and a host of seasonal activities and shows - and even some mince pies! The Nerf Zone and Splash Zone carry an extra charge and we did not review them on this occasion. We were given free entry to the park in order to review. Looks like a great day out, so much to do, I know my 2 would love to spend the day there! 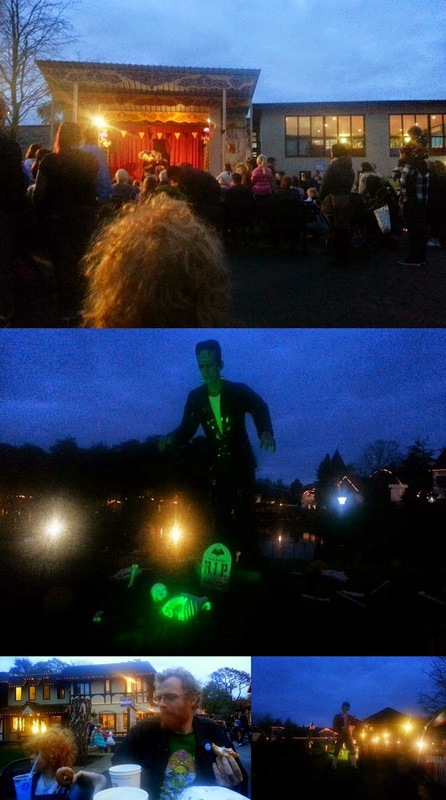 Love all the extra Halloween decorations too, a great time of year to visit. It is! I really thought it'd be too late in the year, but it was gorgeous! That looks perfect for the little ones. I am glad you all had such a fun time. That look so fun! I always scare trying new park but this place look fantastic! My kids would love it! 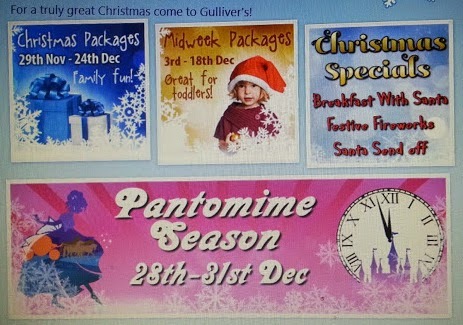 We love Gullivers at Matlock and this one looks just as fab! It looks like you had an amazing day.